Posted by Yilan in Belgian, Belgium, Bulgaria. A Belgian museum seem to have succumbed to Bulgarian pressure to delete the word ‘Macedonian’ from a landmark exhibition of medieval manuscripts. An announced exhibition of ancient manuscripts, “A Thousand years of writing tradition in Macedonia”, which opens soon in the Mariemont Royal Museum in Belgium, has ruffled feathers in Macedonia’s neighbour Bulgaria and led to an unseemly tussle over its name. On the last day of August, the announcement about the exhibition mysteriously vanished from the Royal Museum website. Interestingly, before the announcement was removed from the site, a brief announcement of another exhibition title was posted, called “Traditions of the script”. The changes have caused consternation in Macedonia, though so far the authorities have not clarified whether they will pull the plug on the exhibition if the agreed name is scrapped. The controversy started when some Bulgarian historians and MEPs condemned the planned exhibition in Belgium as a historical falsehood and demanded it be cancelled if the exhibition’s title was not changed. “There are no Macedonian manuscripts dating from 10th and 19th century”, because “the Macedonian nation and language stem from 1944 and nothing cannot be related to Macedonian history before that period,” Bozidar Dimitrov, head of the National Museum in Sofia, told Bulgarian Focus news agency. This controversial historian reflects a notion, not uncommon in Bulgaria, which sees Macedonia as an artificial Yugoslav Communist construct. “I feel sorry for my colleagues from the Royal Museum in Brussels where the exhibition will be held,” he said. “I don’t know if there is anyone to tell them that the term ‘Macedonian medieval manuscripts’ is nonsense,” Dimitrov added. Dimitrov said there are no such things as Macedonian medieval manuscripts, only Bulgarian, Serbian and Greek ones. Bulgarian historian Plamen Pavlov agreed with Dimitrov, saying the Macedonians had fooled the Belgians. Bulgarian MEP Andrey Kovachev, head of the Bulgarian delegation in the right-of-centre European People’s Party group in the European Parliament, went further. He contacted the Belgian authorities and asked them to cancel the exhibition, to prevent “manipulation” of what he sees as “scientific facts” about the Bulgarian nature of the manuscripts. “I explained to the Museum’s head that it is scientifically incorrect for the Museum to present these manuscripts as Macedonian,” he said. “In addition, I have already informed Belgium that we shouldn’t allow the manuscripts to be used for provocations and for manipulation of scientific facts and data. I expect Brussels to respond as soon as possible,” Kovachev added. Kovachev said he didn’t necessarily want the exhibition cancelled. The 39 restored manuscripts written in Cyrillic and Glagolitic alphabet, dating back the 10th to the 19th century, are being prepared for transport to Belgium on October 9.It is the first time that Macedonia has organized such an exhibition outside its territory.The National and University Library, the National Archive, the Institute for Protection of National Heritage, and the Museums in Ohrid and in Bitola have all contributed.Mihajlo Georgievski, specialist in medieval Christian literature, made the final selection. Among the manuscripts are the Asemanii gospel and Zografski gospel, from the 10th century, the Sinai Psalter, Sinai Euchologium, Ohrid Glagolitic scripts from the 11th century and other manuscripts from the 12th century. Some of these manuscripts will be displayed as copies, as the originals are in Moscow and the Vatican Library. All those dating from the 13th to the 19th century such as the Lenten Triodion and Kratovo gospel will be originals. “If the manuscripts are correctly presented, the exhibition can be a model for a common representation of the shared history of the Republic of Bulgaria and Republic of Macedonia,” he said. He maintained that if Macedonia complied, it would be a sign that the country was taking its EU membership hopes seriously. It would show it had “met the recommendations of the European Parliament since the last report on country’s progress towards EU membership”. Focus news agency then reported on August 29 that the Belgian museum had assured Kovachev that the word “Macedonian” woud not feature in the name of the exhibition. The apparent change of plan is an embarrassment for the Macedonian National and St Clement of Ohrid University Library, which planned the exhibition in cooperation with Vallon Brussels International, the Mariemont Royal Museum and the Macedonian embassy in Belgium. The goal was to present the Slavic written cultural and historical tradition through Slavic Christian monuments from 10th to 19th century that contain Glagolitic and Cyrillic enscriptions. Representatives of the Macedonian side have maintained that there will be no cancellation, delay or intervention regarding the name of the exhibition and have refused to comment on the Bulgarian complaints. This exhibition, they say, was agreed a long ago with Vallon Brussels International and the Royal Museum. Two Belgian and one Swiss Slavic experts have already studied the manuscripts and one week after they submitted their report, a green light was given for the organization of this exhibition. “Our task is to look after the country’s cultural heritage but also to present it,” the director of the National and University Library, Mile Boseski, said. “If we didn’t have any consent from Brussels, would we announce the opening date of the exhibition?” he asked. He said that they were already working on preparing the accompanying posters and catalogues for the exhibition. “The manuscripts that will be displayed should bear the term ‘Macedonian’, since they… are from the territory of Macedonia and express the linguistic traits of the Macedonian Church Slavonic language and Macedonian dialects,” the Institute for the Macedonian Language in Skopje, said. 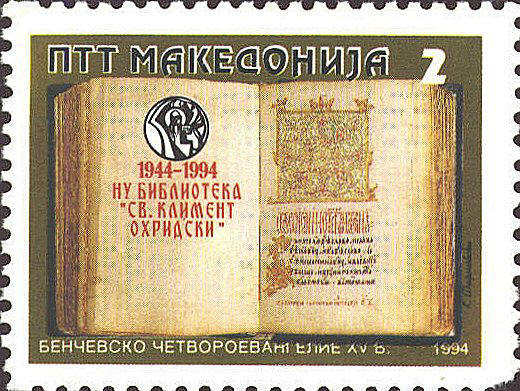 The institute says that for over half a century a number of scientific and cultural institutions in Macedonia have dealt with the study of medieval manuscripts, and have always used the adjective “Macedonian” as a determinant. Macedonian historians say that denial of the Macedonian identity is routine among some of their Bulgarian colleagues and politicians, but not among all. Macedonian historian Ilija Velev says that the Bulgarian reactions have a purely political connotation and don’t deserve much attention, especially because they don’t come from respected experts in the field. “Macedonian manuscript heritage is fully recognized in Slavic studies,” Velev maintained. “Dimitrov and Pavlov… act as political mercenaries… and aren’t taken seriously in Bulgaria, either,” he said. “What is important is that there is no such reaction from the [wider] Bulgarian scientific community, which doesn’t call our medieval manuscript heritage ‘Macedonian’ but old Bulgarian or old Slavic – but fully admits that it belongs to Macedonia,” Velev explained. “No one can erase anything that is verified and established as Macedonian cultural heritage. We shouldn’t get agitated,” he continued. The author of the exhibition, Professor Mihajlo Georgievski, agreed that such reactions from individuals in Bulgaria were to be expected. “What can you expect from an environment which constantly denies your culture, people, identity, everything?” he asked in an interview for the MKD portal. “What hurts them is that the oldest manuscripts stem from Macedonia… and are registered [in world museums] as manuscripts from Macedonia or of Macedonian origin,” Georgievski added. Although Skopje and Sofia have friendly political relations, they have opposing stances on matters past and present, which regularly cause tensions. Skopje claims that a considerable ethnic Macedonian minority exists in western Bulgaria, while Sofia insists that these people are all Bulgarian. Sofia meanwhile complains that Bulgarians in Macedonia are oppressed. Although Bulgaria was the first country to recognise Macedonia after it declared independence from Yugoslavia in 1991, it has not recognised the existence of a Macedonian nation and language as distinct from Bulgarian. Earlier this year the still unreleased Macedonian movie “Third Halftime”, a World War II love story set against the background of the destruction of the Jewish community in Bulgarian-occupied Macedonia, caused another cross-border squabble. Georgievski noted that the manuscripts that are to be displayed mainly date from the 10th to the 12th century, while the rest are from the 13th to the 19th century. “They are originals and are held in Macedonian institutions. These manuscripts originated in Macedonia, are held in Macedonia and, of course, have the linguistic features from the place where they were created… Politics should not interfere in science”, Georgievski added. Posted by Yilan in Belgium, Macedonia, Yunanistan. Upcoming Belgium’s EU Presidency has been informed that the name dispute between Macedonia and Greece is to be settled in few weeks, Foreign Minister Steven Vanackere told Radio Deutsche Welle on Friday. – Yesterday I once again talked with senior foreign affairs officials, who are aware that the ongoing Greece-Macedonia negotiations need discreetness to result in a solution, Vanackere said, refusing to reveal more details that may bring harm to the (negotiating) process. He however expressed belief that the matter should be settled in the next few weeks. Outgoing Belgian Prime Minister Yves Leterme also heralded his opinion, reminding that the name row settlement, in addition to meeting the Union’s membership criteria, is a prerequisite for opening of Macedonia’s EU entry talks. Western Balkans countries will join EU as soon as they harmonize the national with the European legislation, he said. – Belgium is aware that the historic opportunity for the (EU) integration of Western Balkan countries has to be seized. However it should be evaluated first whether the Copenhagen Criteria and all other standards have been meet for opening of the accession talks. It is clear that the name dispute with Greece still exists and it is a matter that should be resolved, Leterme said. Today Belgium, which is to take over the EU Presidency on July 1, presented its programme, which sets the enlargement process as its fifth priority.